Python’s logging module provides a powerful framework for adding log statements to code vs. what might be done via using print() statements. It provides a system of logging levels similar to syslog-style levels that can be used to produce both on-screen runtime diagnostics as well as more detailed logs with full debug level insights into per module/submodule behavior. Managing usage of logging() can be complicated, especially around the hierarchical nature of the log streams that it provides. I have developed a simple boto3 script that integrates logging to illustrate a basic usage that is easy to adopt and, in the end, not much more work than using print() statements. For detailed information on logging beyond what I present here, consult the excellent Python docs on the topic, as well as the links in the References section at the end of this post. The setup for logging() that I am using involves two configuration files, logger_config.yaml and logger_config_debug.yaml. The difference between the two files has to do with the log levels used by the log handlers. 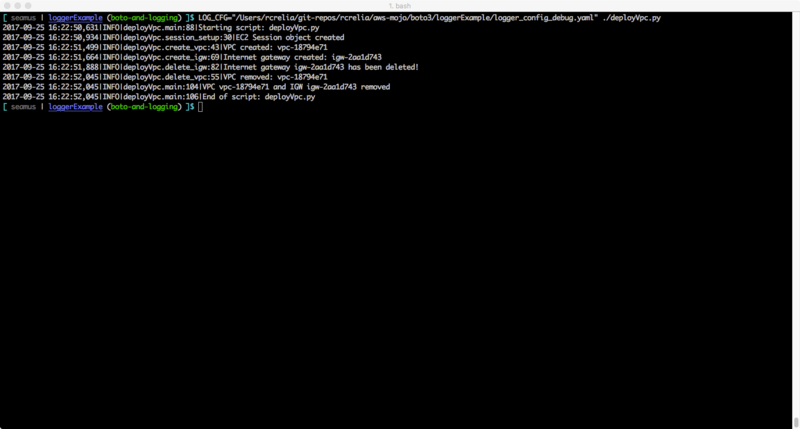 By default, the example module deployVpc.py uses the logger_config setup. This config will produce no screen output by default except at the ERROR level and above. It produces a log file, however, that contains messages at the INFO level for the module and at the WARNING level for boto-specific calls. Note: boto (including botocore) ships with some logging() active at the INFO level. While not as detailed as DEBUG, there’s enough busyness to that level of logging by boto that you will likely want to not see its messages except when troubleshooting or debugging your code. This is the approach I took with the current configuration, by opting to set custom logger definitions for boto and friends, so that the root logger will not by default display boto’s native log level messages. format: "%(asctime)s %(levelname)s %(module)s %(message)s"
I chose to use YAML for the configuration file as it’s easier to parse, both visually and programmatically. 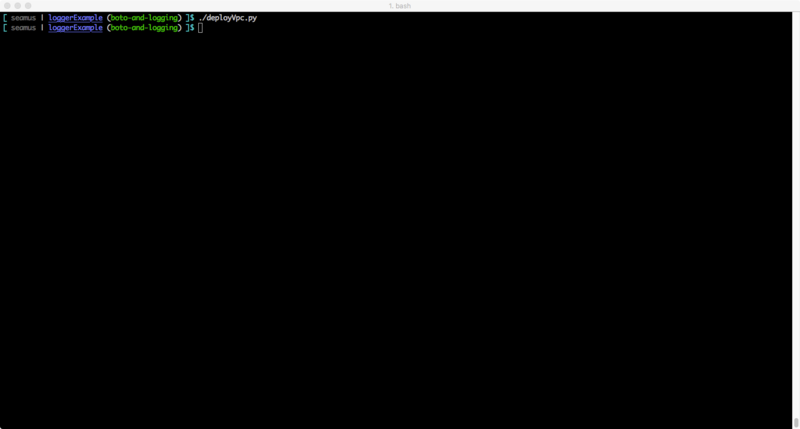 By default, Python uses an INI file format for configuration, but both JSON and YAML are easily supported. At the top of the file is some basic configuration information. Note the disable_existing_loggers setting. This allows us to avoid timing problems with module-level invocation of loggers. When logging per module/submodule, as those modules are imported early in your main script, they will not find the correct configuration information as it’s yet to be loaded. 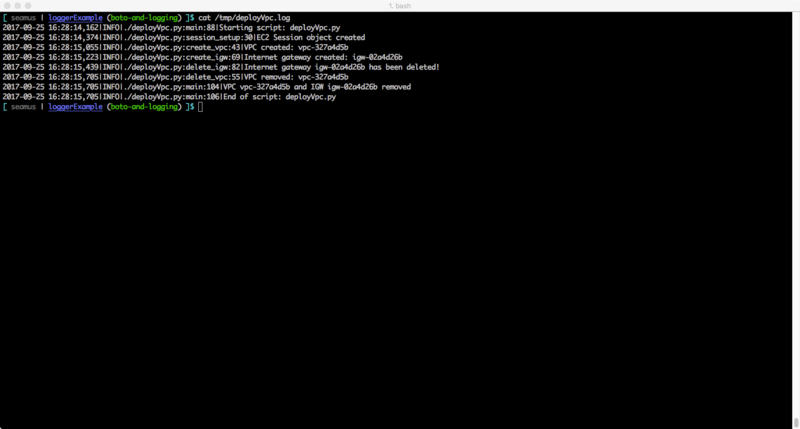 By setting disable_existing_loggers to False, we avoid that problem. By default, I leave simple for the console handler (for root logger), use fancy for the screen handler, and debug for the logfile handler. Handlers are used to define at what level, in what format, and exactly where a particular log message should be generated. 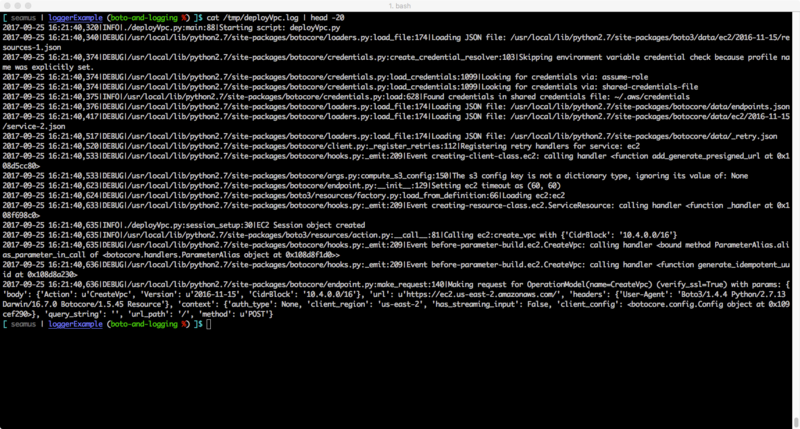 I’ve left console in its default configuration, but added a StreamHandler and a RotatingFileHandler. Python’s logging module supports multiple types of handlers including Syslog, SMTP, HTTP, and others. Very flexible and powerful! Loggers are referenced in your code whenever a message is generated. The configuration for a given logger is found in this section of the configuration file. In my case, I wanted a separate logger per module/function if necessary, so I’ve made entries at that level. I also include entries for boto and friends so I can adjust their default log levels so I don’t see their detailed information except when and where I want to (i.e., by logging at WARNING instead of INFO or DEBUG for normal operation). A logger entry also defines where log streams should end up. In this case, I send all streams to both my screen handler and my logfile handler. I also don’t want custom loggers to propagate messages throughout the logging hierarchy (i.e., up to the root logger). So I’ve set propagate to “no”. """Setup logging module for use"""
logger_config = home + "/git-repos/rcrelia/aws-mojo/boto3/loggerExample/logger_config.yaml"
logger_debug_config = home + "/git-repos/rcrelia/aws-mojo/boto3/loggerExample/logger_config_debug.yaml"
"""Setup logging configuration for debugging"""
You would simply edit the first line to use .configure_debug() instead of .configure(). Usage is straightforward, simply do the following in each module you wish to use logging(). Refer to the deployVpc.py script for the full syntax and usage around these bits of code. Note: By using __name__ instead of a custom logger name, you can easily re-use this setup code in any module. That’s all there is to it. Below are some screenshots that show the handler output (screen and logfile) for both the default and debug configurations. Hopefully this will encourage you to look at using Python’s logging() framework for your own projects. The full source for all of the logging module configuration as well as sample boto script is available over on GitHub in my aws-mojo repository.